If you’ve found that finding your right bra size is a frustrating process, there are some sizing hacks that can make finding your perfect fit much easier. One of the most effective of these is the use of “Bra Sister Sizes”. 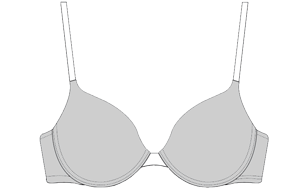 You may be unaware that every bra size has several "Sister Sizes"- these are sizes which have an equivalent cup capacity, despite the letter of the cup size being different. Knowing your sister sizes can help you find your best fit when buying bras that run smaller or larger than normal. It’s a common misconception that the larger the cup size, the larger the bra, no matter what the band size (i.e. a 32F is larger than a 36B, a 34C is larger than a 38A, etc). However, this is not the case. 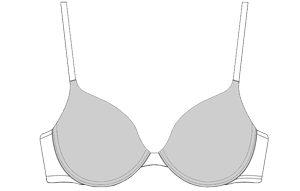 During the bra manufacturing process the same exact bra cup may be paired with different band lengths to create multiple bra sizes. 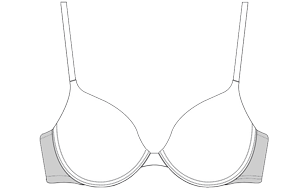 For example, the same exact cup is used to make 38A, 36B, 34C, 32D, AND 32DD bras! The reason for this is that within each cup size (A, B, C, D, DD, etc), as the band size increases, the cup size also slightly increases even though the letter does not. For example, a 34B bra and 36B bra will not only have different lengths, but the capacity of the cups will also differ. Once you understand that there are equivalent “sister sizes” to your own bra size, it can help you solve any bra fitting issues you may have. Each row shares the same cup size and each column shares the same band size. Sizes in black are sizes we make. Sizes in light gray are sizes we dont make. need a different band size. If the cups of your bra fit well but the band is too big or too small, getting your best fit will require both the band size AND cup size to change. For example, if you are wearing a 34B bra and the band is tight but the cups fits well, instead of going up to a 36B which may result in the cups being too large, you should choose your equivalent sister size, 36A. need a different cup size. If your band fits great but your cups are too big or too small, keep the band size the same and just adjust the cup size based on your needs. For example, if you are wearing a 34B bra that fits in the band but has cups that are too small, you should choose a 34C. If you have fit troubles with both the band AND the cup, the band will change but the cup size will likely stay the same. For example, if you are wearing a 34B that is too small in both the band and the cup, you should try a 36B because it would have a larger band and a larger cup. Most women would think they should get a 36C, however a 36C would be an increase of both 1 band size and 2 cup sizes. By knowing your correct bra size, as well as what your sister sizes are, you will be able to choose the best option to give you a perfect fit. You’ll also eliminate much of the frustration associated with bra shopping! For more sizing help, international size conversions, or to try our new mobile sizing app, please go to our Sizing Help page by clicking here. Will Upbra work for me? Am I getting the correct size?